Few people remember that the Civil Rights leader believed social change only happens in the context of community. On January 16, we celebrate Martin Luther King Jr. Day. One of America's greatest heroes, King was a well-known Civil Rights champion who was assassinated in 1968 while in Memphis supporting striking sanitation workers. It is a wonderful thing when holidays or public places like streets and parks are named for progressive heroes. When I leave our office, I'm often stopped by the traffic light at the corner of Gerry Adams Way, named in 2002 after the Irish militant who fought British oppression for many years, and Martin Luther King Jr. Way. Having grown up in the South where many cities and streets are named after long-dead racist leaders, I smile every time I see these two Oakland street signs. Yet a problem comes when the ubiquity of the naming lets the meaning of the person named fade from our consciousness, or when the person so named becomes one-dimensional in our memory. And it always rankles me to see those who fight the ideas of the named person basking in the limelight at memorial events. Many of those who are politically attacking public employees today will be at holiday events loudly claiming their affection for King and his legacy, even though they know that King was killed as he was trying to win more wages and benefits for public servants in Memphis. 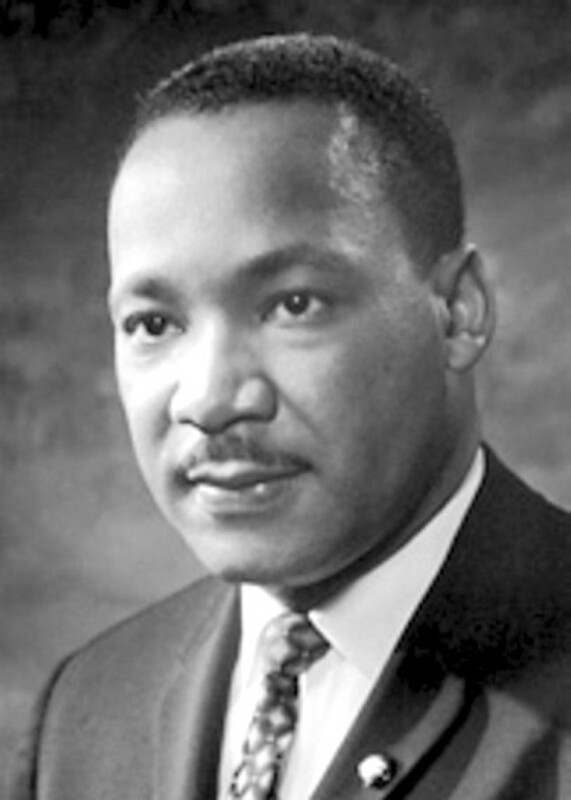 King had numerous accomplishments: his nonviolent activism; his extraordinary "I Have a Dream" speech in Washington, DC in 1963; his Nobel Peace Prize; and his efforts at the end of his life focusing on ending the war in Vietnam. But one often-unrecognized aspect of King's work and of his differences with fellow Civil Rights leaders of the Sixties came in his unbridled belief in the importance of community as compared with individualism. It is only recently that I have realized the depth of King's writings. Known mainly as an activist and orator, his writings are profound. For Martin Luther King, all human life was interrelated and survived, as well as culminated, in a beloved community. Others, like his mentor Howard Thurman, framed the issue in the relationship between a person and her God. King's view is explicitly Christian, yet at its core it defines any productive society as "the mutually cooperative venture of persons in which they realize the solidarity of the human family by assuming responsibility for one another." King argued for the sacredness of the "beloved community," and the importance of all of us in this community. King stressed notions of love, power, and justice and their relationship to the economic and political nature of social existence. It was through his conception of the beloved community that King framed and fought for the goals of the Civil Rights Movement, maybe the most important movement in the history of this country. King's emphasis on community included his vision of agape, the love for the other. In his concern for social justice, King believed "the interior religious experience finds meaning in the context of social relations based on power." His emphasis was on persons as social actors. As such, he had a notion of freedom that can only be exercised in the social existence with others. Outside of this social existence, he wrote, "freedom is a misnomer." Here, King aligned with Aristotle, who wrote that "man is by nature a social and political being." Aristotle just left out women and slaves in his framing. From this position came King's theoretical argument against segregation, which he said was mainly at fault for creating a social system that constrained a person's ability to be free and to exercise that freedom. While he was for legal rights, the problem with racism is not that it violates rights but that it is morally wrong. We would do well to understand this dichotomy in our current obsession with using human rights language as the be-all and end-all in every moral situation. King saw the coming of the focus on "me" that infects the narrative of the American Dream today, and argued against it. He saw that an age of individualism would strip workers, minorities, and the poor of the ability to unite. In this belief, he found common ground with social Buddhists like Thich Nhat Hanh, Catholic liberation theologians like Gustavo Gutierrez, and his fellow African-American Christians involved in the American Civil Rights Movement. In the last few centuries, it is within such religious communities that the many explicit examples of the use of community in social change can be observed. Coming out of the progressive aspect of their religious traditions with concerns for the poor and against war and bloodshed, people were able to perform heroic acts because their actions were framed within their communities. King identified three social manifestations of evil and sin that hinder the actualization of beloved communities: poverty, racism, and war. While King understood the importance of overcoming personal sin to achieve the personal self-actualization that is found only in community, his emphasis was on the social dimension of evil and sin and the necessity of cooperation in overcoming or ameliorating them. This is a timely lesson for us all. Have a happy holiday.